All looks are exclusivly from ShopBop!!! There is nothing like partnering with other babes to collaborate on a special project! For this Shopbop spring shoot I worked with Christy, of Crowns By Christy and Deanna First, the amazingly talented fashion illustrator to celebrate one of our favorite spring trends! If you couldn’t already tell by the feminine and flirty silhouettes we are wearing, the theme of our shoot was the “New Romantics” trend that has quickly come back in style! I couldn’t be happier as this trend embodies everything I love: romance, magic, and an overload of floral prints! 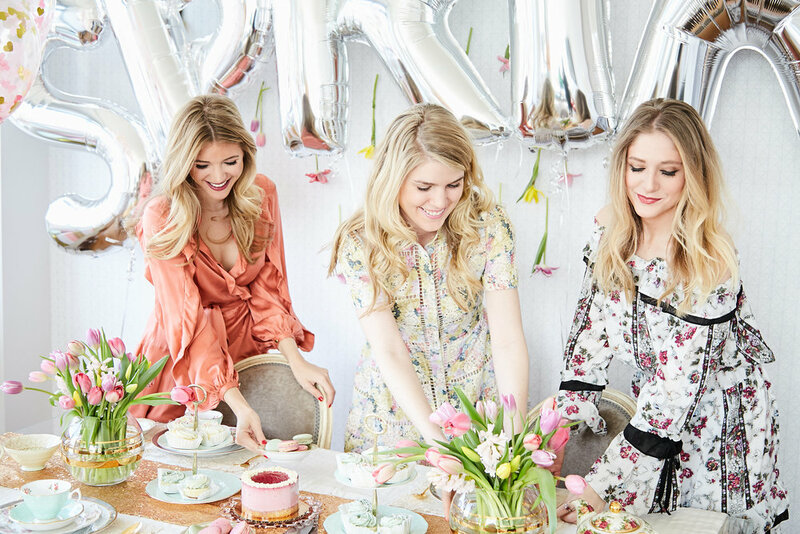 Christy adorned the table with a mix of gorgeous spring tulips, cakes, and fresh macaroons to embody our own version of a mad hatter tea party, while Deanna did live sketches of our outfits. I have known Deanna for a while now, and have yet to see her live sketch. It was so mesmerizing to watch I could barely pay attention for the photos. If you haven’t already seen her work … GO CHECK IT OUT NOW!!! She is beyond talented, and so incredibly easygoing and inspiring to work with! After the live sketching finished we headed up to the roof to shoot our looks in the natural light. What I love most about the New Romantics trend are the delicate pastel hues that come with it. There is just something about the colors and silk fabric that really indicate that the winter is officially over. I know I have said it a million times, but there is something so motivating when working with other women in the industry. I could have NEVER in a million years have pulled out all the stops in the details for this shoot alone. I loved being able to bounce ideas off Christy and Deanna for everything we did. I hope this shoot inspires you to go out and find your favorite spring trend and rock it until summer! For some of the other trends head to www.shopbop.com!